I have a favorite great aunt in her 80s and the dates of our trips to Scotland are planned purposely to cooincide with her birthday. She is the younger sister of my paternal grandmother. Those were the days of big families - they were 15 sisters and 1 brother. 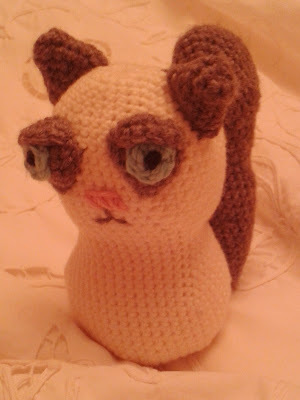 She loves cats so of course I had to make her an amigurumi cat and settled on grumpy cat. I have since learnt that grumpy cat is actually a well-know celebrity Tardar Sauce with it's own Facebook page and many fans. Hilarious! My great aunt is such fun, will chase the children around the house and we really enjoy singing old Scottish songs together (obviously with a wee drink or two).